All species of Kangaroos are herbivores which means that they only eat plants. The specific types of foods that are consumed really depends on the specific species of Kangaroo that you are talking about. Generally you will find all species of Kangaroos resting in shady areas during the day. They will move around looking for food at night and during the early morning hours. Most species are grazers which means that they move around consuming different types of food. They consist of shrubs, grass, and even fungus. The teeth of these animals are designed to help with the feeding process. For example they have sharp incisors so they are able to cut the grass very close to the roots. They also use their molars to grind up the grass. However, they don’t grind the food and chew it. Instead, they grind it enough to moisten it and then they swallow it whole. Then they go through the process of regurgitating it as a form of cud. From there they will chew it up once again and then completely swallow it. Their overall diet consists of being very high in fiber as well as very low in protein. They are able to do well on such a diet though due to the unique design of their stomach. It features multiple chambers inside that actually have bacteria in them. This bacteria helps them to break down the plant cell walls. That is what allows their bodies to release the nutrition from them into the body of the Kangaroo. Kangaroos do need some water for survival but they can go for several days without any of it. They can also get large amounts of the water they need through the grass that the eat during the rainy season. When they do need water and it is scarcely around, they will use their feet to dig deep into the ground until they find it. Due to the natural habitat of many of these Kangaroos continually being taken away by humans, it becomes increasingly difficult for them to find enough food and water to survive on. That is a huge concern by those that are interesting in preserving these areas for the future of Kangaroos. In many areas, cattle and sheep have also been introduced to them. 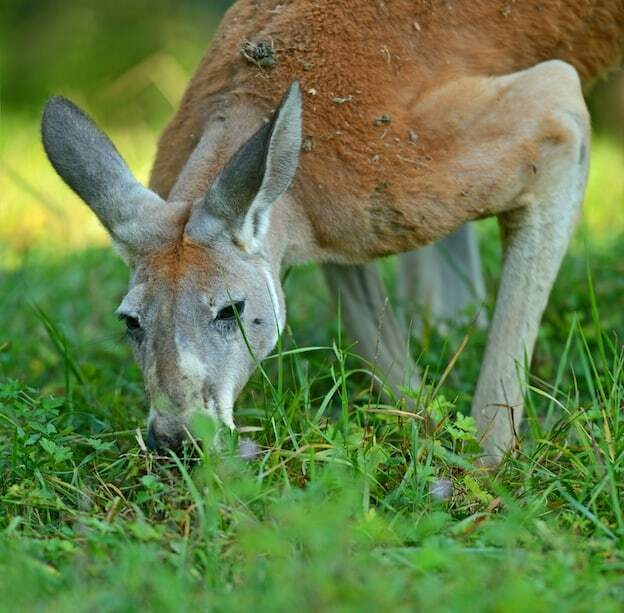 As a result the Kangaroos find themselves competing with these other animals for the same food sources. This can make it very hard for them to continue living in a given location. As a result they may have to span out in different directions in order to get their basic needs met. On a side note, due to the number of roads that end up being in place between crossing locations for Kangaroos, there are many mothers killed there. As a way of helping to protect the young joeys that may be alive in the pouches there are methods of feeding them so that they can be kept alive. The age of the joey will determine what it is fed. As long as it has hair growing in it then it is old enough to be cared for outside of the mothers pouch. A bottle with milk in it can offer the baby the nutrition it needs until it is older. Some people do this on their own and then turn the Kangaroo loose to fend for itself a few months later. A better alternative though is to take it to a refuge or a vet that is willing to care for these orphaned Kangaroos. Then they can be fully evaluated, cared for, and either released into the wild or placed in captivity.